Allatoona Creek Park is a great 15 mile multi-use trail system, geared specifically towards mountain bikers, with singletracks ranging from beginner to expert. 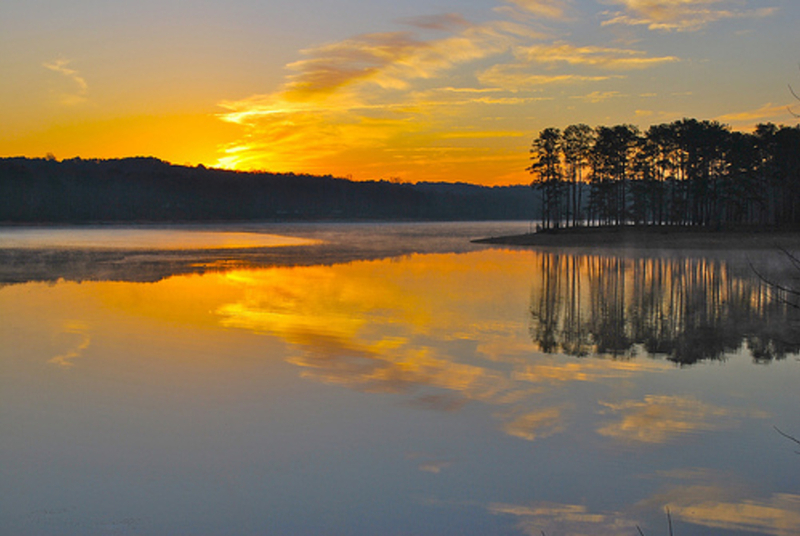 It is situated right next to Lake Allatoona, and many of the trails run alongside or over Little and Big Allatoona Creeks. There are four singletrack loop systems for mountain bikers offering trails that are appropriate for beginners to expert riders, as well as a central trail dedicated to trail runners and hikers. Most of these tracks are feasible for majority of riders; the lower level loops provide lots of smooth, flowing areas, allowing you to gain a considerable amount of speed. The beginner trails are the Turtle Back Connector (.4 miles) is a flat track that crosses over Allatoona Creek and the wetlands. The Rusty Bucket Loop (1 mile) is named for the hundreds of rusty paint cans found while building the trail has some tight, twisty sections that weave in and out of a thicket of pines. Mason’s Bridge Connector (.4 miles) is the only doubletrack. It runs parallel to Allatoona Creek and connects Rusty Bucket and Mason’s Bridge Loop. The intermediate loops are the Turtle Back Loop (4 miles), which is mostly fast flowing, but includes some berms, dips, bridges, rock features and tight turns. Turtle Back Spur (1.4 miles) branches off of the Turtle Back Loop, and offers more intense climbs and faster flowing sections. Mason’s Bridge Loop (5 miles) consists of two separate loops, borders the wetlands, rock outcrops and is full of dips and turns. The only expert trail is the aforementioned Whipper Snapper; it’s only half a mile long, but not for the faint of heart! It includes ladder bridges, log rides, rock gardens, gap jumps, drops and rock jumps. The area is set for expansion and will eventually offer a full 20 miles of riding trails. The scenery here ranges from open fields to heavily forested areas, and even wetlands. While cruising by the wetlands, you are bound to see a number of blue herons. 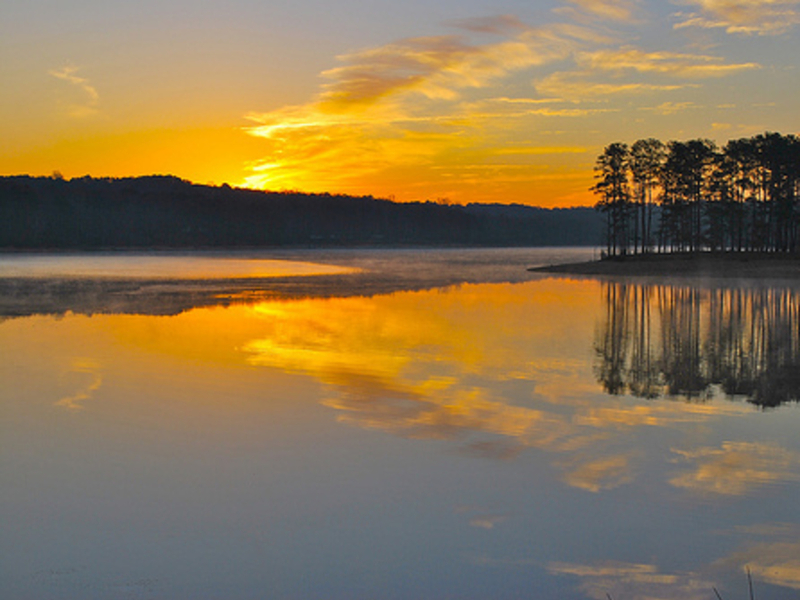 You’ll be riding along and crossing over Big and Little Allatoona Creeks, and can catch the occasional view of Lake Allatoona. The beginner and intermediate tracks are relatively flat while the more advanced tracks are littered with small hills throughout, but the elevation change is only slight. The tread on all tracks in this park are full of roots and rocks to dodge, adding a little extra technicality. On the more advanced tracks at Allatoona Creek Park, you’ll be winding through the pines on these narrow singletracks, passing through tree gates, switchbacks, tight turns and along a few steep, narrow ledges. Short of the single expert trail, the Whipper Snapper, there are few technical challenges in this park; however, that makes this a perfect place for beginners or anyone wishing to further develop their skills and proficiency before moving on to more technical riding locations. There are two trailheads: one at Old Stilesboro Road (listed) and another off Pitner Road. The lot at Old Stilesboro has bathrooms and drinking water available. The Pitner location has bathrooms, drinking water, a picnic pavilion and even a dog park. Parking is free at both locations. On Saturdays (9am-6pm; 10am-6pm Sept-Oct) and Sundays (10:30am-5pm), Silver Comet Cycles rents mountain bikes at the Old Stilesboro lot, so this is a great option for someone who is wanting to get into the sport, but not ready to make the investment on a bike just yet. Trails are open sunrise to sunset EXCEPT for the following months due to hunting season: September / October - Trails open at 10 a.m. November / December - Trails are completely closed - Hunters ONLY January - Trails open at 10 a.m. ALWAYS check this site for the trail status before riding.